This entry was posted in News Releases and tagged Hiring event, idaho department of labor, idaho falls, idaho jobs on July 19, 2018 by Idaho Department of Labor. Bonneville School District 93, in partnership with the Idaho Department of Labor, has scheduled a hiring event Tuesday, June 12, from 10 a.m. to 1 p.m. at the district office, 3497 N. Ammon Road in Idaho Falls. This entry was posted in News Releases and tagged Hiring event, idaho department of labor, idaho jobs, job fair on June 7, 2018 by Idaho Department of Labor. The Family Dollar is planning to fill multiple positions for its new store in Grangeville at a hiring event Tuesday, June 5, 10 a.m. to 3 p.m. The event takes place at the Grangeville Department of Labor office, 158 E. Main St., Suite 1A. Job seekers will meet with the store’s hiring authority who are planning to fill two assistant store manager positions and hire more than 15 temporary customer service representatives. This entry was posted in News Releases and tagged Grangeville, Hiring event, idaho department of labor on May 29, 2018 by Idaho Department of Labor. Businesses will have the chance to recruit youth for current job openings and career opportunities at a youth hiring event June 13, 1 – 3 p.m. at the Idaho Department of Labor’s Twin Falls office, 420 Falls Ave. The event provides a venue where businesses can connect with potential employees, provide career awareness and expose attendees to the many opportunities their companies have to offer. This entry was posted in News Releases and tagged Hiring event, idaho department of labor, Magic Valley on May 22, 2018 by Idaho Department of Labor. Many Boise area employers will be looking for candidates, from entry level to management positions, at the May 23 hiring event, 4 – 6 p.m., at Garfield Elementary, 1914 S. Broadway in Boise. A partial list of employers attending include CS Beef Packers, Event Rent Idaho, Genesis Community Health, Darigold, BoiseCodeWorks, PSSI, DBI Services, Jacksons Food Stores, GCA Services, Community Partnerships of Idaho, MultiCare Home Health & Personal Care, Idaho Department of Environmental Quality, Idaho Department of Correction and Idaho State Department of Education. This entry was posted in News Releases and tagged Boise, Hiring event, idaho department of labor on May 18, 2018 by Idaho Department of Labor. Attracting top talent to your business can be challenging. Hiring events allow employers to quickly connect with several prospective employees. To successfully recruit talent at an event, preparation is key. This entry was posted in Employers and tagged Anthony DeVille, employers, Hiring event, idaho department of labor, job fair on September 28, 2015 by Idaho Department of Labor. Meet the Employer, an informal way for local businesses to discuss openings and talk with job seekers about working for their firms. The event will be held in the Kootenai County local office from 10 a.m. to noon on the second Wednesday of each month. 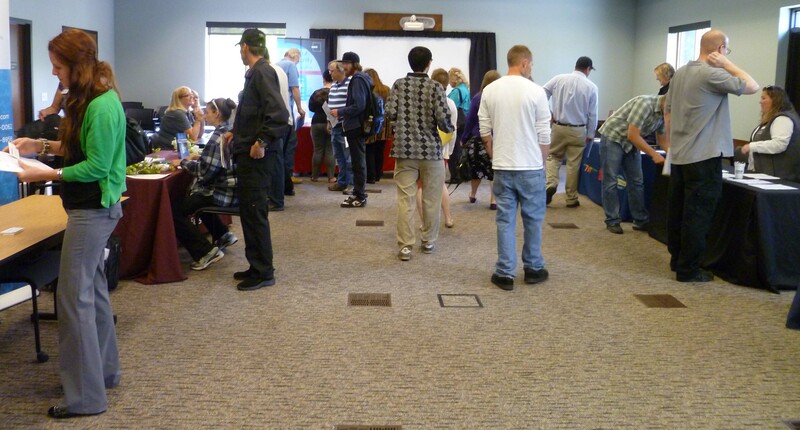 Job seekers were actively engaged with employers at the first Monthly Hiring Event at the Kootenai office of the Idaho Department of Labor. The first event, held in June, was attended by 300 job seekers and 15 businesses, including Xaact Products, Life Care Center of Post Falls and Silverwood Theme Park. This entry was posted in Employers, Job Seekers and tagged Hiring event, idaho department of labor, job seekers, Kootenai County on July 30, 2013 by Idaho Department of Labor.